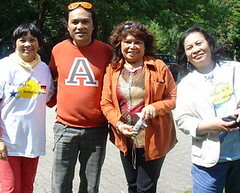 The Bol-anon sa Germany participated in Santacruzan in Oberhausen and sold local delicacies as a part of its fundraising campaign. Manay Tess (Bertumen Wilms) met a young artist from Guindulman, Bohol Mr Sam Penaso. They are under the sponsorship of a Batangueno art impresario Mr Virgilio G. Cuizon. Sure that's me! After 2011. Taga dis a man sa Guindulman ni? Taga Tabajan ba? I know for sure that Guindulman has produced lots of talented guys and fine artists, foremost but still unknow are the Pelinio Brothers (Toto and Jess) of Ponod. Sa Bulawan we had the late Aloy Kimpang. Thanks Manay for posting. With my best regards to all of you there! Say and be Heard! Your Opinion Matters! Hala oy nabanhaw si pinangga! Miss na miss kita. Sam is from Sawang he is 33 years old. Grabe ka hectic kadtong adlawa apan nagkahigayon gihapon mi ug istorya.